Ruthie Ann Miles was walking with a friend and their kids in Park Slope when a car ran a red light and struck them, police said. The woman behind the wheel should not have been driving. Roseanne Colletti reports. The 44-year-old woman who plowed into a pregnant Tony-winning actress walking with her friend and their two young children, killing both kids, in Park Slope two months ago has been indicted in connection with the case. Dorothy Bruns was arrested at her Staten Island home Thursday on a 10-count indictment charging her with manslaughter, criminally negligent homicide, assault and other crimes in the violent March 5 crash at Ninth Street and Fifth Avenue that killed 4-year-old Abigail Blumenstein and 1-year-old Joshua Lew. Bruns had run through a red light just before slamming into the children, Abigail's pregnant mother, pregnant Tony-winning actress Ruthie Ann Blumenstein (stage name Ruthie Ann Miles), and Joshua's mother Lauren Lew in the crosswalk. All four were found on the pavement with varying degrees of injuries. Cops later learned a fifth pedestrian, a 46-year-old man, had also been hit and had been taken to the hospital in stable condition. Bruns told police at the time she had medical issues -- and though her license had been suspended she had not been criminally charged in the case until now. Prosecutors said Thursday that she had in fact suffered a seizure at the time of the collision, and had been driving in direct defiance of a doctor's orders following a hospitalization less than two months prior. That hospitalization stemmed from yet another car crash -- that time just into a parked vehicle. appointments, Bruns did drive and was involved in another fender bender. "Besides having seizures, she also has coronary problems, she also has MS," Assistant District Attorney Craig Esswein said in court. "She is the last person who should have been in a car. It is for selfish reasons she continued to drive." Brooklyn District Attorney Eric Gonzalez said in a statement, “The loss of Abigail and Joshua was a horrific – and avoidable – tragedy that devastated their loved ones and hurt so many of their friends and neighbors. Her alleged insistence on driving despite doctor’s orders and serious medical conditions that prevented her from safely doing so was not only irresponsible, it was unlawful. I intend to now hold her accountable and urge all drivers to heed instructions of medical professionals and never drive a car when told not to." 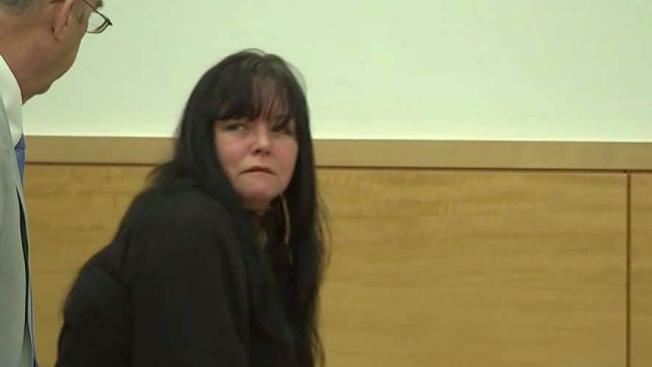 Bruns walked slowly into court Thursday, with her hands handcuffed behind her back. She was barely able to get out of her chair and she leaned on a walker as she left the courtroom, with tears in her eyes. Surveillance footage from the Park Slope scene is chilling; it shows a white Volvo stopped at the intersection. Then the sedan creeps forward, missing pedestrians crossing on the near side of the road and a car that had the right-of-way. It then appears to speed up somewhat as it slams into the group in the crosswalk across the intersection. The car drags Joshua's stroller halfway down the block, hitting a parked car and an unoccupied car, before coming to a stop. According to witnesses, Bruns had her head hanging back when she drove into the intersection, prosecutors said Thursday. First responders observed her to be foaming from the mouth, confused and unsteady on her feet. She suffered a seizure in the ambulance and again at the hospital, prosecutors said. Blumenstein, who also appeared in TV's "The Americans," was taken to the hospital in critical condition after the middle-of-the-day crash. She was recently said to be improving -- and her unborn baby miraculously unharmed. Bruns was ordered held on bail of $75,000 bond or $25,000 cash with a followup court appearance next month. She faces up to 15 years in prison if convicted of the top charge. It wasn't clear if she entered a plea Thursday, nor was attorney information for her available. The crash shattered the stroller-friendly family community, which has called for action on driving laws in the aftermath of the crash. New York City Councilman Brad Lander said the crash could have been prevented and that the driver -- who police believe had a seizure -- shouldn't have been behind the wheel. Lander had pushed for the district attorney to file charges in the case. Blumenstein won her Tony Award in 2015 for her role as Lady Thiang in "The King and I." She was slated to perform next week at a charity concert called Broadway Baby Mamas in midtown, according to her Twitter account. She also starred in the fourth season of the critically acclaimed FX drama "The Americans," playing the Korean wife of a government worker who befriends the Russian spy couple played by Keri Russell and Matthew Rhys. Roseanne Colletti contributed to this report.